If you’re a writer, freelancer or blogger then I think we can both agree about the phrase – Writing blog posts ain’t an easy stuff. Writing SEO Optimized blog posts was a very difficult thing and our whole focus on creating quality blog posts for our loyal readers. If you’re a blogger, then you’ve seen and listen many times on the internet, “Content is King”. If you can create quality contents, then believe me, blogging is for you. If you’re able to create quality blog posts, then readers and search engines too, automatically attract to you and your ranking will increase automatically. Search engines loves quality contents, and readers only want information, so it is very important for us to write SEO optimized articles that our readers like and share. I’ve seen many times, people get started blogging, because they think it is a very simple think just like as clicking on their hand, simply “Add New Blog Post” and write something about it that describe what you want to tell to your readers and hit on “Publish” button. Then they hopelessly wait for some likes, social sharing, comments on their posts, but no one comes because readers wants information and new & fresh content. So if you want to writing quality contents which are unique, fresh and valuable for your readers then follow these 13 SEO checklists that you do before publishing blog posts. If you do it properly, then believe me your ranking will be automatically increase within days because search engines loves and like unique and quality contents. People think that is doesn’t matter, but if you want to become a professional writer and blogger, then always remember that, “keyword Research” is only the very first thing to do for higher ranking, because without this, you can’t even get ranked in search engines. You can simply use Google Keyword Tool for doing keyword research. But there are also many other ways to do keyword research. You can also use some best keyword tools that are the great alternatives to Google Planner Tool which helps you a lot for finding targeted keywords and competing your competitors. Headlines are the very first thing which is seen to everyone before whole story. People just read headings / post title of your post, and if it is attractive then they try to read out your whole article. Always research your primary keyword and include your keyword in post title that helps you to getting higher ranking, because search engine indexed your titles and display in the results shown to Google user’s. Also design your title and make it more catchy and attractive, because if you want to attract more visitors then always make your title more awesome and eye catching. URL or Web address of every single articles into your blog is different. So you can always optimized it with different ways. When you find your targeted keyword and include it into your post title, then same targeted keyword use in your post URL / permalinks. Search engines index it and when any one search the term on the search engine, robots will find that search keyword in post URL, and if it is exist into your post, then there are very high chances for you to getting higher ranking. This is my 4th best SEO checklist which is known as Meta tag description. This description is different of every single page into your blog. It is make sure that you can able to select extremely fully SEO optimized and descriptive text upto 150 characters that is easy to read. In SERP (Search Engine Result Page) only upto 150 – 160 characters shown and if your meta description long, then it must be hide in search results. So it is very important for you to write only upto 150 characters long meta description and include your primary keyword in it also. Images speaks better than texts. Generally images have a deep affects as compared to text to peoples and people get more attracted from images. It grab more attention from your readers also break up your article and share something different thoughts inside your articles. These all things are above, because the biggest benefit of use images inside blog posts is the SEO. Search engine loves those web pages where images are used with texts. So always optimize your images using ALT tag, because search engine only understand and read about the image of what about is? After reading their ALT tag. Simply use these three basic rules and optimize your images. 1 – Always save your images as “image-name.jpg” before uploading them to web server. 2 – Don’t forget to add ALT Tag. 3 – Use Title Tag too with ALT Tag. 5 – If copy from elsewhere, then always add source of that images. These rules are important and if you apply properly then your images get ranking. That means, you’ll get more traffic via images search engines. It is very important for you, if you want to adding your videos inside your post, then always doing is wisely and choose only relevant videos. It is very beneficial for SEO point of view, by adding a video to a blog post makes it as more complete resource and fully optimized blog post. If you’ve a business / company then always create more videos and use inside your blog posts. It helps you to get more organic traffic from search engines. Search engine loves blogs, that have a video inside their articles. But this is not an important thing to add it. But if you try it and use properly then you might get higher ranking. Headings always plays important role in any place whether offline or online. It also break up your articles just like images. Headings provide you very big-time SEO benefits. Generally, H1 headings use in post title. If you’ve a blog on WordPress, then their all templates by default use H1 in title. Almost in all CMS system, it is use by default. Don’t use again H1 heading inside article, because search engine doesn’t allow. But you can target the primary keyword in H2 heading which you can use inside your post. Search engine robots prefer H1 heading more then H2 and all other by row. Always target the same keyword which you use in H1 heading also use in H2 heading inside post. This will helps to increase your website traffic from search engines. You can also use all other headings like H3, H4 etc and important editing tags like Bold, italic, underline too, which are important in SEO. If you don’t space and break your texts and write in a sequence then anyone doesn’t understand what you write. If you write your post in a single paragraph, your readers doesn’t read it properly and within a few time they bored and hopefully leave your site. It is very important for you to break your texts into small paragraphs that looks more pretty and awesome and easy to understand. Also improve your writing skills more and write awesome style paragraphs and optimize it as much as you can. Also try to use headings of each paragraph. If not possible, then use headings where possible and make your article look more attractive and readable. Many newbies doesn’t care about keyword density and writing articles on any topic and use keywords as much as they can and think that they get ranked easily without any hesitation. Is Keyword Density is Now Irrelevant? But this tactics comes under “Keyword Stuffing”. Don’t be a spammer, always write naturally and care about keyword density. Generally, density is about 1.5% to 2% only. But people use many same keywords and this thing comes to keyword stuffing and this manners drop down your ranking and sometime search engine block your site. In 500 words article you can use upto 10 primary keywords only and if you use above this limit, then it comes to under keyword stuffing and Google don’t be allow this thing. Call-to-action is something marketing material that you use at the end, or start or between your every single post. It is very important to encourage your readers to do something that helps you to engaged with readers. Like you can encourage your readers at the end of every blog post to comment below this post with some relevant but tricky question, so who one interested to your article, then they try to answer the question which helps your blog engagement grow. There are many other important and popular call-to-action stuffs like share the post, doing it, read more, relevant contents, surveys, like us, buy it etc. As you already published many blog posts into your blog. Interlinking is the most powerful way / tool for the ranking pages. Links are plays important role in SEO. In between articles, you can interlink to your previous published articles that helps your readers to read your previous posts too and make these posts live forever. Search engines do prefer those web pages that contains quality interlinking, because they known behind every single link, the whole web page exists which describe all about the same anchor texts. But don’t be crazy about it. Always choose anchor texts wisely and create internal links of your old posts to your new posts. This helps you to increase your page views / impressions and also visibility in search engines . Content is king and without content your blog just a garbage bag. If you cannot produce quality contents then blogging is not for you. Many newbies just reading some articles, and writing to any particular topic as much as they can and cannot care of the quality of the post. Search engines tells to webmasters, always focus on the quality not quantity. If you writing article about 1000+ words and solve any problem. But the same article solve the problem just in 400 words, it means you’re only focus on quantity. Search engine only loves quality articles, so always focus on your quality and write useful informative and descriptive article in an awesome writing styles that your readers loves. Proofread is important stuff if you want to share a valuable resource with your readers. In first attempt, not all be set properly. If you review your whole blog posts then you’ll find many errors which loss your ranking. So first of all grammar check your whole post and correct all spelling mistakes and grammar mistakes. Then all correct all other mistakes. Proofread is very important especially if you want to write a professional article. This may sound monotonous, but believe me it is not bad idea if you proofread your whole article. 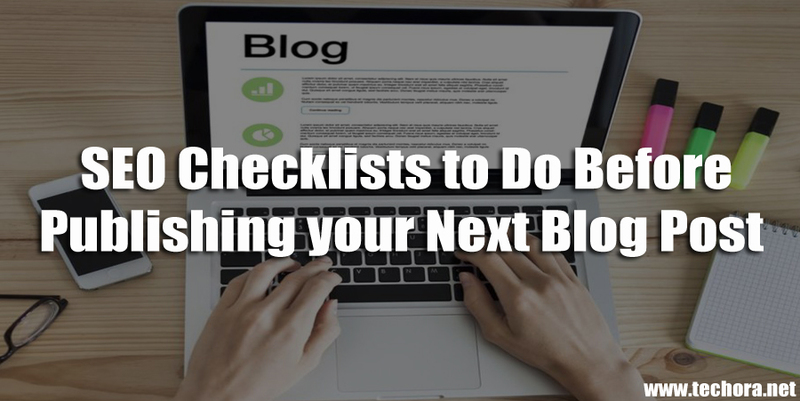 These are my whole study 13 Best SEO Checklist to Do before publishing your blog posts. These tips helps you to get higher ranking easily in SERP. As much traffic you receive on your blog, as much money you earn. If you find this article helpful for others then must share it just for support me. For any further knowledge or your kind suggestions comment below or simply contact me.